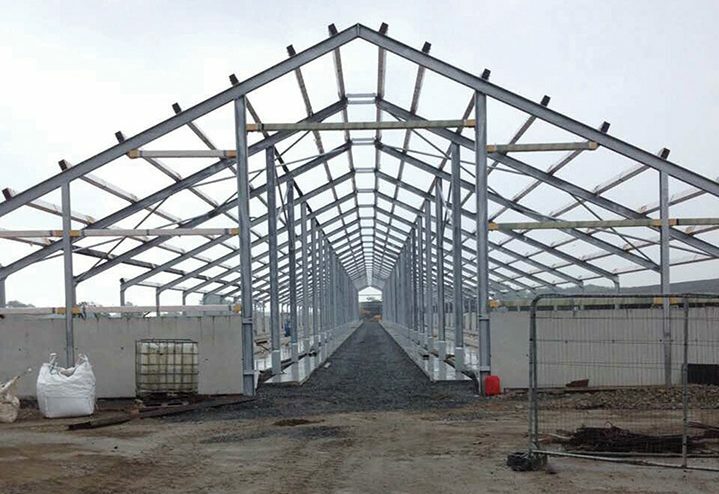 Celebrating a quarter of a century in business, Brouder Brothers Steel Ltd (BBS) – ‘For Structural Integrity’ – is a leading provider of quality farm buildings based in Rathangan, Co. Kildare. The family-run business can supply and fit all available types of steel frame and cladding, and also specialises in asbestos removal. BBS was established in 1994 by Timmy and Colman Brouder following the passing of their father Colman Snr. The company had previously traded as Colman Brouder & Sons, with Colman Snr having set it up 20 years earlier after working for both Butler’s Steel and O’Dwyer Steel. “He put up the first hay shed for Paddy Butler,” Timmy proudly states. BBS has grown to employ a 35-strong team comprising steel erectors, fabricators, engineers, architects and administration personnel. Employed as workshop and site foremen respectively, Colman Jnr’s son John is the third generation of the Brouder family to work in the business. Boasting an impressive client list, the company has invested heavily in state-of-the-art cutting and drilling equipment, and prides itself on its efficient, professional, friendly and value-for-money service. BBS can fabricate, erect and design any size of building to suit your requirements. If you prefer to erect your own shed, the company can cut and supply fabricated steel and accessories to order. It manufactures cladding (non drip, PVC and polyester) of all colours as well as multi-beam purlins. Everything from bolts and screws, flat plates, angles, box sections and H iron to roller and sliding doors, gutters and flashings are supplied. “Only the best material goes into making our sheds,” Timmy stresses. “We are a one-stop shop for all your agricultural building needs. We supply and fit fully CE and grant approved buildings. We manufacture and supply at the keenest prices. All of our steel is shot-blasted and primed, and is manufactured through an automated cut and drill line to exact specification. If the client is going to build the shed himself / herself, we can supply the cladding, galvanise, timber and purlins separately. As already mentioned, BBS is a certified supplier of CE marked structural steel to the requirements of EN 1090 up to and including Execution Class 3 (EXC3) which covers the fabrication of all farm buildings and structural steel used in general construction. Since July 2014, under the Construction Products Regulations (CPR), it has been a legal requirement that fabricated structural steelwork delivered to construction sites must be CE certified. “Anyone who isn’t CE certified shouldn’t be in this business. A farmer can’t apply for grant aid if he or she is not dealing with a CE certified company. We’ve been CE approved since 2012,” Timmy explains. The Brouder’s run a separate company called Asbestos Removal Ireland which they set up four years ago. This company provides an unrivalled asbestos removal and disposal service to customers nationwide. All staff are fully trained and certified, with all relevant certificates and insurance details available on request. Asbestos Removal Ireland is renowned for its professionalism and reliability, always strictly adhering to the relevant quality and Health & Safety standards. With no two projects being the same, the asbestos removal team carefully assess each building before they began their work in order to provide the most appropriate solution. Frees quotations and advice is offered to all customers, no matter how big or small the job is. “The two businesses go hand-in-hand. We can remove asbestos from farm buildings in a safe and efficient manner and replace the roof. We have three on-site crews, two of which are steel erectors and one which is dedicated to asbestos removal. It’s a real team effort with everyone having their own job to do,” Timmy adds. In summary, BBS is committed to providing a top-quality product and service at the most competitive price. All of their buildings are solid, secure, attractive in appearance and are built to last a lifetime. Here’s to the next 25 years of the successful family business!